This article was first published in the Harvard Divinity Bulletin, Winter/Spring 2015 (Vol. 43, Nos. 1 & 2). Recently, there has been a growing discussion of climate change as a moral issue, both in academia and in religious communities. This past fall I spoke at three religion and climate change conferences in as many months, including a conference at Harvard Divinity School, “Spiritual and Sustainable: Religion Responds to Climate Change,” and in June 2015 I will join many global thinkers at a process theology conference on climate change in Claremont, California. The highly anticipated encyclical from Pope Francis on climate change will undoubtedly contribute and bring attention to this discourse. Frequently, however, the acknowledgment that climate change is a moral issue on which religious people should engage is the end of the conversation. There has not been nearly enough discussion about what it means to engage with this moral challenge. We have not yet answered how and where we should be taking our stand in response to climate change. 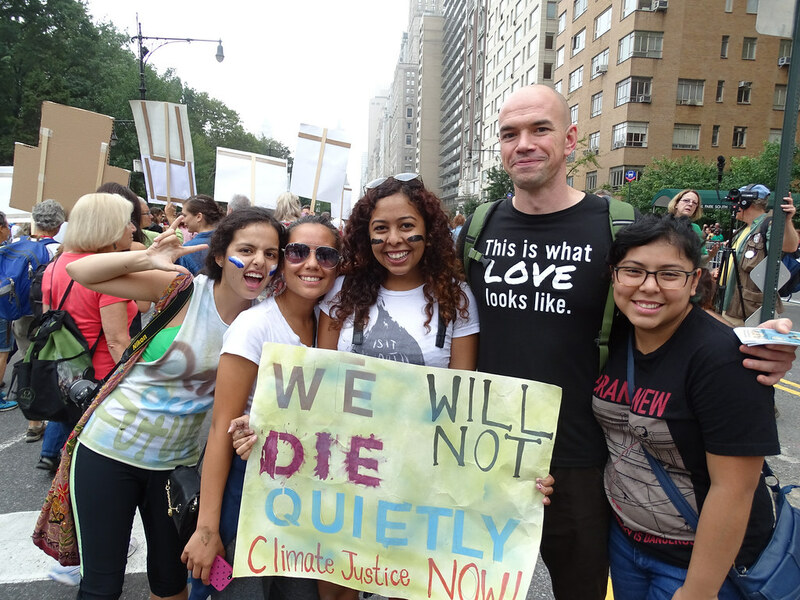 I argue that when religious people answer the call of the climate crisis, we must bring real moral leadership to the climate justice movement. The first kind of engagement with the climate crisis is usually a change in consumer behavior, reducing one’s personal carbon footprint. In our consumer-focused society, it is not surprising that the first obvious role to which we turn is that of a consumer. We see thousands of advertisements a day that remind us we are consumers. So when we seek to make an impact, we immediately think of our power as consumers. After first changing our personal carbon footprints, we then turn to our collective consumption and try to impact our organizational carbon footprint. In the buildup to the pope’s encyclical, I’ve already heard some talk about getting Catholic churches to weatherize their buildings and put solar panels on their roofs. This is useful and important work, but, as the history of the climate movement demonstrates, this obsession over consumer behavior has limited benefit and tends to reinforce the mindset that created the problem in the first place. We got to this point of environmental crisis by “buying” into the notion that our value as people lies in our role as consumers. Furthermore, this focus on consumer activism naturally becomes a rich person’s movement. The mantra of “vote with your dollars” means that those without many votes (dollars) don’t matter very much. Part of the role of the church is to remind us that we are more than consumers. Like many organizations, churches can bring to life our role as citizens, community members, and family members. In addition, churches are uniquely suited to develop our identities as children of God, pieces of an interdependent web of existence, or bearers of divine sparks of creativity. Connecting with these nonconsumer ways of being in the world is an adequate definition of empowerment, which is the basis of any social movement. A movement empowered by the elevation of these nonconsumer identities is a necessity for the revolutionary change that the climate crisis demands of our energy, political, and social systems. Thus far, religious communities have primarily engaged with climate activism by getting behind the climate movement. When 350.org launches a divestment campaign, churches and denominations get on board to divest their endowments. When Bill McKibben asks clergy to participate in civil disobedience, they show up with their collars on. But waiting to be told what to do is not moral leadership. As a veteran of the climate movement, I suggest that we don’t need religious communities merely to join the climate movement. We need religious communities to lead, challenge, and deepen the climate movement. The first imperative of moral leadership in the climate movement is to speak the hard truths about the nature of our challenge. Implicit in the idea of climate justice is the goal of keeping most fossil fuel reserves in the ground. There may be a way to do that while still ensuring the profits of the corporations that expect to extract those fossil fuels, and certain misguided initiatives like the United States Climate Action Partnership have pursued that agenda. But what separates the climate justice movement from other climate-related players is the mission of keeping those fossil fuels in the ground without guaranteeing future profits to the corporations who have already profited from exploitation. This means that our agenda in the climate justice movement involves costing the richest and most politically powerful corporations in the world trillions of dollars in lost future profits. Keeping those fossil fuels in the ground also means costing some of the individuals at the top of that industry, like the Koch brothers, billions of dollars in expected profits. It is worth remembering that because of its structural nature, this is an industry that has killed for profit throughout its history. In my home state of West Virginia, which has been extracting fossil fuels longer than anywhere else in this country, coal has cost countless lives and has left the state as the least livable in the nation.1 As the impacts of climate change are increasingly felt, fossil fuels cost more lives around the world every year. Not only has the fossil fuel industry continued trading human lives for profit, but, since it is difficult to convince free people to poison their own water sources or blow up their own backyards, it has increasingly killed democracy in order to keep killing people for profit. The exploits of the Koch brothers in this area are well known,2 and we as a nation have normalized the way that oil companies leverage our government to launch wars and overthrow governments that are not conducive to extraction. In Colorado, where citizens launched a ballot initiative to give local municipalities a say about fracking in their towns, Anadarko and other fracking firms pledged $50 million to fight the push for local democracy.3 From Nigeria to Ecuador, the oil industry has proven itself willing to assassinate activists who stand in the way of exploitation. In short, the fossil fuel industry has made it quite clear that they will not relinquish those trillions in future profits without an intense fight. To be at all serious about climate justice means being willing to engage in a real struggle that will inevitably demand real sacrifices. Moral leadership in this movement requires admitting the truth that if we are at all successful in undermining the future profits of the fossil fuel industry, there will be a backlash that will likely cost some of us our lives. Regardless of what roles we play in the movement or what tactics we use, if we are to be truly effective, we will be drawing a target on our backs at which the fossil fuel industry will take aim. If we intend to take a stand against that kind of structural evil, we will have to be standing on solid rock. Compounding this challenge of getting in the way of the profits of the richest and most ruthless corporations is the fact that we need to do so during a time of corporate ascendancy, when both parties of the United States government are beholden to corporations. As Naomi Klein argues so forcefully in her 2014 book, This Changes Everything: Capitalism vs. the Climate, the ideological victory of free-market fundamentalism is our major obstacle to making the changes that are necessary to address the climate crisis. Part of the reason that mainstream climate organizations have embraced false solutions is that adequate climate solutions are politically unfeasible in our current system of corporate rule. The work of revolutionizing our energy economy must also involve ending corporate personhood and creating a democracy in the process. If we are going to take a stand for that kind of revolutionary change, we will have to be standing on solid rock. In addition, we are no longer tackling this challenge from the position we were in in 1992, when we had the opportunity to make a smooth transition to an ideal, healthy world. We are doing this work in 2015, after decades of emissions increases, despite the warnings. This means that, even if we are as successful as possible at reducing emissions, we will still face massive impacts and hardships on a scale likely to be catastrophic to our global civilization. If history is any guide for these times of desperation, those in power will probably use desperate measures to hold on to their power by scapegoating certain classes of people and by pitting us against one another. I am convinced that our greatest vulnerabilities to climate change are not physical conditions like low-lying cities, but rather our social divisions—classism, racism, and sexism. These divisions make us vulnerable to responding to crisis with fear and hatred rather than solidarity, with competition rather than cooperation. These are the scenarios that turn hardship to horror. This means that even as we revolutionize our energy, economic, and political systems, we must do so in a way that also dismantles classism, white supremacy, patriarchy, xenophobia, and other social evils. If we are going to stand against that kind of structural evil, we will have to be standing on solid rock. These necessary goals are so bold as to seem unreasonable. As has been the case in every social movement that has struggled for fundamental change, there will undoubtedly be setbacks and points at which there can be no reasonable expectation of success. The movements that persevere are those which find a form of hope, a reason to continue the struggle, even in those dark times. The conventional wisdom of the climate movement is that optimism is the only form of hope, for without optimism people will have no reason to continue the struggle. But optimism is a silly and fragile kind of hope. This is the most important point around which religious leaders must not follow the movement, but must provide moral leadership. I believe that a major reason why religious communities have played an important role in so many social movements is that in those moments of despair, when optimism is ridiculous, religious people base their hope on faith and continue the struggle. In those dark moments we continue to struggle for justice, because that is what it means to be faithful to the people we love, to be faithful to the world we love, and to be faithful to a God who loves the world. As religious leaders, we are not called to be optimistic; we are called to be faithful to our love. We are called to the climate movement, not merely to add respectability with our signatures on a petition. We are called not just to provide photo ops with collars out front. As people of faith, we are called to be the rock of the climate justice movement, the solid rock of hope that remains strong on the darkest days. Let us pray we are up to the challenge. 1. West Virginia was ranked last in a 2012 Gallup poll measuring thirteen metrics to determine which states will be the best places to live in the future. 2. For example, see the Media Matters for America report on the far-reaching political influence of the Koch brothers: Denise Robbins, “Myths and Facts about the Koch Brothers,” August 27, 2014. 3. See Joel Rosenblatt and Jennifer Oldham, “Longmont’s Fracking Ban Tossed as Colorado Vote Looms,” July 25, 2014.